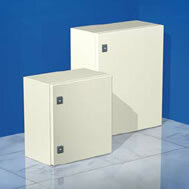 CE Boxes. Structure: 15/10 thick sheet steel, painted textured RAL 7035. 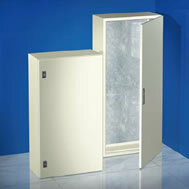 Mounting panel: 20/10 thick galvanized steel. Door: reversible, with one box locking element painted textured RAL 7035, provided with a seal applied by continuous molding. Cable gland plate: appropriately dimensioned and located on the box bottom. 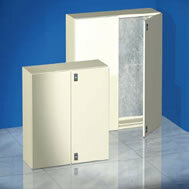 Protection degree IP 66 complies with NEMA 4. Impact resistance degree as per IEC EN 62208: IK10. 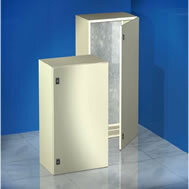 1 locking element, box. SKU: CE.0683-.1283. Category: DKC. 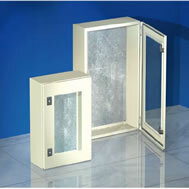 Tags: dkc, DKC Sheet Steel Enclosures depth 300mm, double door enclosure, glazed enclosure, sheet steel enclosure.